The new Black Shiver 85 OB is intented for those who looking for a small size boat that keeps the charm and peculiarities of these famous and higly demanded boats. The small size does not preclude the standards of larger models or customize it according to their own tastes and needs. At the highest level also the components with touch screen panels, custom accessories such as folding soft t-top and the bow thruster. Several are the engine options with the possibility of have one 350 hp OB engine, twin 200 hp OB or twin 250 hp. The Black Shiver line is a custom product that combines elegance, performance and flexibility of use. The distinctive features of the 100 are beauty, high quality of materials used, speed and safety. 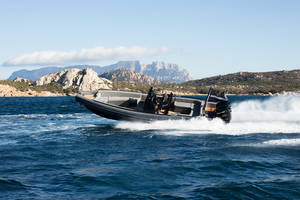 Such a handsome and high-tech maxi-tender will blend perfectly with any large luxury yacht. Aesthetically fascinating and technically exciting, it is coveted by every boat owner who loves style, elegance and high performances. The interior of the 100 offers spacious living areas, standard Sunbrella cushions, a head, a swim ladder and much more, all made with the finest materials. Customization choices are very wide and varied. Available in two versions with an outboard or inboard motor, the Black Shiver 100 will take you to your destination so quickly – with more than 50 knots maximum speed – that you will not want to get off because you will miss that little thrill that only our boats are able to provide. The Black Shiver 120 is about to make its debut and like the other members of the series it is a rubber dinghy boat with a sporty and streamlined profile, designed for those who love speed without sacrificing elegance. 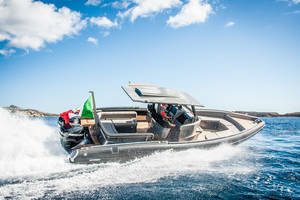 Made with high quality materials such as teak, steel, Kevlar and carbon, the 120 will be fully customizable and will offer the most demanding boat owner all options to be "tailored-made". The standard version includes ample sun decks, comfortable seating, Sunbrella cushions, a head with shower, a swim ladder and much more. Even for the 120 two engine options are available motors – inboard or outboard – with power up to 900 Hp capable of achieving thrilling speeds! Designed for a demanding clientele, the Black Shiver 140 is a high performance rubber dinghy boat which at the same time offers spacious and elegantly furnished accommodations. Its exterior lines are aggressive and dynamic, while comfortable seating and large sundecks make for a pleasant and relaxing cruising. The Black Shiver 140 has enough space to fit a small galley and a head with shower. The Black Shiver 140 is available in two versions, with either an inboard motor and hydrojet or an outboard. Either configuration makes for a fast, smooth and safe way of transporting mega yacht guests, when used as a support boat, or family and friends if used as a day cruiser. Practically fully customizable, the 140 offers endless possibilities for tailored alterations with a wide choice of high quality materials and colors. The standard version of the hull, superstructure and the tube are black or gray.With an impressive speed of 50 knots, the 140 will take you anywhere you want to go quickly and you surely will not go unnoticed. 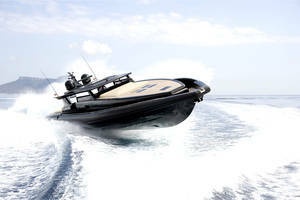 Gorgeous, powerful, huge – the Black Shiver 220 is a distillation of power, technology, luxury and design. Tailored exclusively to meet its owner’s specifications and reflect his personality and taste, the 220 offers several layout options and an endless combination of materials and colors. While sporty and graceful its exterior lines make you feel the power of the 220, while the interior, with its welcoming spaces, offers a level of comfort like few others. Huge sundecks, spacious seats, one or two cabins, head, galley and a crew area allow the 220 to be not only a tender for mega yachts but also a self-sufficient means to cruise anywhere while arousing admiration and wonder in anyone in sight. 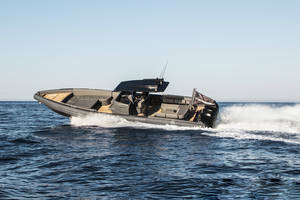 The numbers and performance reach competition levels, the powerful motors and hydrojets push it to over 50 knots, the hull is designed to cruise at its top performance under all conditions, and the shallow draft allows you to get into shoal waters thus allowing an incomparable connection with the sea. Last uniqueness, but not least in order of importance, the tubes used for the 220 and the entire Black Shiver line use a special shock-resistant rubber foam that is resistant to punctures and does not deflate thus offering greater safety and stability and allowing a larger interior space because of its semicircular shape. Everything is controlled from a console which is the quintessence of technology, not unlike the cockpit of a jet plane.